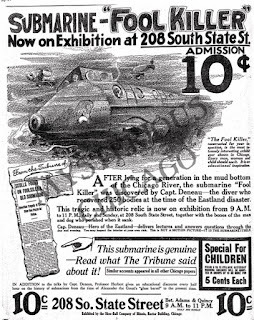 We love to talk about the Foolkiller, the submarine wreck that was found buried under three feet of muck in the Chicago River in 1916. It’s one of those great mystery stories where you think you’ve exhausted the last bit of data on it, then, next thing you know, another clue pops up. 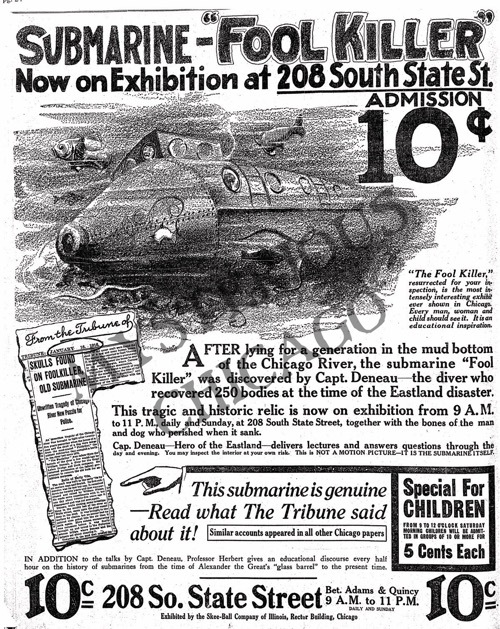 A bit of a refresher for if you didn’t hit the link: In 1916, diver William Deneau found the wreck of a homemade submarine in the Chicago River. 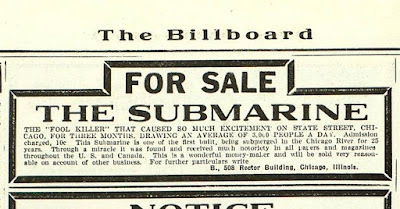 Newspapers published all sorts of stories about where the submarine came from, none of which can really be verified. 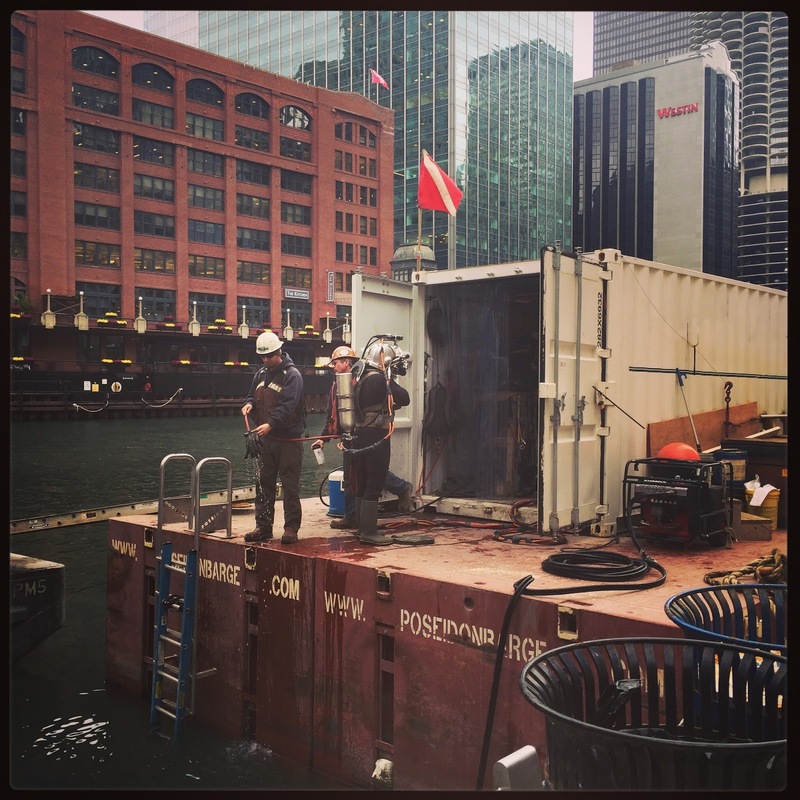 Some say it was built and sunk around 1850 by a submarine inventor named Lodner Phillips. Others say it was a military test craft, or something used by Peder Nissen, the daredevil sailor. In any case, Deneau raised it up and put it on display on South State Street for a while. Shortly thereadter it became a bit of a carnival attraction, appearing at a fair in Oelwein, Iowa. Until this week, its last known location was on display at the Riverview amusement park in Spring, 1916. Did someone buy it? Did he find no takers and sell it for scrap? The world may never know, but the stream of clues never quite seems to end here. As more and more papers and magazines are digitized, new clues become available. 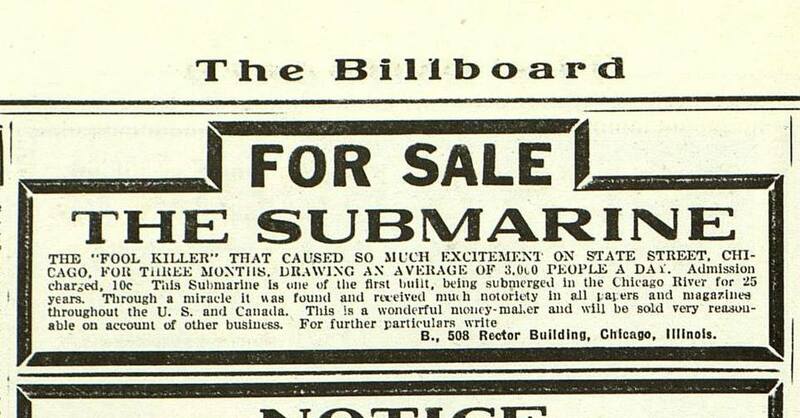 One other thing I can bring up is that now and then people tell me they think Deneau probably knew that the submarine was there along, and raised it up when he needed some money. But, by way of introducing some anecdotal evidence, a couple of weeks ago I brought a lunch hour walking tour group to the site where it was found just as divers were at work digging logs out of the river bed. They told me that even with modern lighting equipment, visibility in the river is about a foot and a half, maybe three feet. And that’s when they first go in – once they’ve been in there and moving around for a minute, they’re practically working blind. So it’s entirely possible that something as large as a 40 foot submarine could have been buried under the river muck for years. Big thanks to Jeff Nichols!